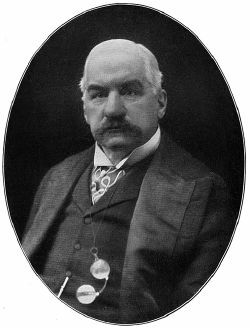 John Pierpont Morgan (April 17, 1837 – March 31, 1913) was an American financier, banker, philanthropist, and art collector who dominated corporate finance and industrial consolidation during his time. In 1891, Morgan arranged the merger of Edison General Electric and Thompson-Houson Electric Company to form General Electric. After financing the creation of the Federal Steel Company he merged the Carnegie Steel Company and several other steel and iron businesses to form the United States Steel Corporation in 1901. He bequeathed his large art collection to the Museum of Modern Art in New York City. At the height of Morgan's career during the early 1900s, he and his partners had financial investments in many large corporations. By 1901, he was one of the wealthiest men in the world. He died in Rome, Italy in 1913 at the age of 75, leaving his fortune and business to his son, J. P. Morgan, Jr. He was a benefactor of educational institutions and of museums. His company continues to regard working to improve the community as one of its core principles, contributing millions annually to not-for-profit organizations around the world and endorsing eco-friendly policies. J. P Morgan also sponsored the work of photographer Edward S. Curtis in recording the heritage of Native Americans at a time when little interest was shown by the vast majority of Americans of settler descent in Indian history or culture. 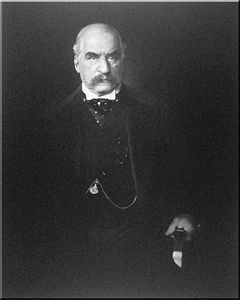 J. P. Morgan was born in Hartford, Connecticut to Junius Spencer Morgan (1813–1890) and Juliet Pierpont (1816–1884)) of Boston, Massachusetts. Pierpont, as he preferred to be known, had a varied education due in part to interference by his father, Junius. In the autumn of 1848, Pierpont transferred to the Hartford Public School and then to the Episcopal Academy in Cheshire, Connecticut, boarding with the principal. In September 1851, Morgan passed the entrance exam for English High School of Boston, a school specializing in mathematics to prepare young men for careers in commerce. In the spring of 1852, illness that was to become more common as his life progressed struck; rheumatic fever left him in so much pain that he couldn't walk. Junius booked passage for Pierpont straight away on the ship Io, owned by Charles Dabney, to the Azores in order for him to recover. After convalescing for almost a year, Pierpont returned to the school in Boston to resume his studies. After graduating his father sent him to Bellerive, a school near the Swiss village of Vevey. When Morgan had attained fluency in French, his father sent him to the Georg August University of Göttingen in order to improve his German. Attaining a passable level of German within six months, Morgan traveled back to London via Wiesbaden, his education complete. Morgan entered banking in his father's London branch in 1856, moving to New York City the next year where he worked at the banking house of Duncan, Sherman & Company, the American representatives of George Peabody & Company. From 1860 to 1864, as J. Pierpont Morgan & Company, he acted as agent in New York for his father's firm. By 1864–1871, he was a member of the firm of Dabney, Morgan & Company; in 1871, he partnered with the Drexels of Philadelphia to form the New York firm of Drexel, Morgan & Company. In 1895, it became J. P. Morgan & Company, and retained close ties with Drexel & Company of Philadelphia, Morgan, Harjes & Company of Paris, and J. S. Morgan & Company (after 1910 Morgan, Grenfell & Company) of London. By 1900, it was one of the most powerful banking houses of the world, carrying through many deals especially reorganizations and consolidations. Morgan had many partners over the years, such as George W. Perkins, but remained in firm charge. Morgan's ascent to power was accompanied by dramatic financial battles. He wrested control of the Albany and Susquehanna Railroad from Jay Gould and Jim Fisk in 1869, he led the syndicate that broke the government-financing privileges of Jay Cooke, and soon became deeply involved in developing and financing a railroad empire by reorganizations and consolidations in all parts of the United States. He raised large sums in Europe, but instead of only handling the funds he helped the railroads reorganize and achieve greater efficiencies. He fought against the speculators interested in speculative profits, and built a vision of an integrated transportation system. In 1885, he reorganized the New York, West Shore & Buffalo Railroad, leasing it to the New York Central. In 1886, he reorganized the Philadelphia & Reading, and in 1888, the Chesapeake & Ohio. After the United States Congress passed the Interstate Commerce Act in 1887, Morgan set up conferences in 1889 and 1890 that brought together railroad presidents in order to help the industry follow the new laws and write agreements for the maintenance of "public, reasonable, uniform and stable rates." The conferences were the first of their kind, and by creating a community of interest among competing lines paved the way for the great consolidations of the early twentieth century. Morgan's process of taking over troubled businesses to reorganize them was known as "Morganization." Morgan reorganized business structures and management in order to return them to profitability. Morgan's reputation as a banker and financier also helped bring interest from investors to the businesses he took over. In 1902, J. P. Morgan & Co. purchased the Leyland line of Atlantic steamships and other British lines, creating an Atlantic shipping combine, the International Mercantile Marine Company, which eventually became the owner of White Star Line, builder and operator of RMS Titanic. In addition, J P Morgan & Co (or the banking houses that it succeeded) reorganized a large number of railroads between 1869 and 1899. After the death of his father in 1890, Morgan took control of J. S. Morgan & Co (renamed Morgan, Grenfell & Company in 1910). Morgan began talks with Charles M. Schwab, president of Carnegie Co., and businessman Andrew Carnegie in 1900 with the intention of buying Carnegie's business and several other steel and iron businesses to consolidate them to create the United States Steel Corporation. Carnegie agreed to sell the business to Morgan for $480 million. The deal was closed without lawyers and without a written contract. News of the industrial consolidation arrived to newspapers in mid-January 1901. U.S. Steel was founded later that year and was the first billion-dollar company in the world with an authorized capitalization of $1.4 billion. U.S. Steel aimed to achieve greater economies of scale, reduce transportation and resource costs, expand product lines, and improve distribution. It was also planned to allow the United States to compete globally with Britain and Germany. U.S. Steel's size was claimed by Schwab and others to allow the company to pursue distant international markets (globalization). U.S. Steel was regarded as a monopoly by critics, as the business was attempting to dominate not only steel but also the construction of bridges, ships, railroad cars and rails, wire, nails, and a host of other products. With U.S. Steel, Morgan had captured two-thirds of the steel market, and Schwab was confident that the company would soon hold a 75 percent market share. However, since 1901 the business' market share dropped, never reaching Schwab's dream of 75 percent market share. Morgan also financed manufacturing and mining businesses and controlled banks, insurance companies, shipping lines, and communications systems. Through his firm came enormous funds from abroad to help develop American resources. 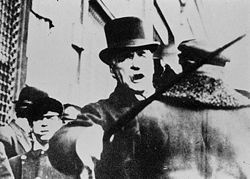 Enemies of banking attacked Morgan for the terms of his loan of gold to the federal government in the 1895 crisis, for his financial resolution of the Panic of 1907, and for bringing on the financial ills of the New York, New Haven & Hartford RR. In 1912, he appeared and publicly defended himself before a congressional committee headed by Arsène Pujo, which was investigating the “money trust” and which was aimed particularly at him. In 1900, Morgan financed inventor Nikola Tesla and his Wardenclyffe Tower with $150,000 for experiments in radio. Tesla was unsuccessful and in 1904, Morgan pulled out. At the height of Morgan's career during the early 1900s, he and his partners controlled directly and indirectly assets worth $1.3 billion. Morgan was a lifelong member of the Episcopal Church in the United States, and by 1890 was one of its most influential leaders. Morgan was physically large with massive shoulders, piercing eyes, and a purple nose, because of a childhood skin disease, rosacea. He was known to dislike publicity and hated being photographed; as a result of his self-consciousness of his rosacea, all of his professional portraits were retouched. He smoked large Havana cigars called Hercules' Clubs and often had a tremendous physical effect on people; one man said that a visit from Morgan left him feeling "as if a gale had blown through the house." Morgan was scheduled to travel on the maiden voyage of RMS Titanic but cancelled at the last minute. Morgan died while traveling abroad in Rome. On March 31, 1913, just before his 76th birthday, Pierpont Morgan died in his sleep at the Grand Hotel. Nearly four thousand condolence letters were received there overnight and flags on Wall Street flew at half-mast. The stock market was also closed for two hours when his body passed through Wall Street. At the time of his death, he had an estate worth $80 million (approximately $1.2 billion today). His remains were interred in the Cedar Hill Cemetery in his birthplace of Hartford. His son, J. P. Morgan, Jr., inherited the banking business. Morgan was a notable collector of books, pictures, and other art objects, many loaned or given to the Metropolitan Museum of Art (of which he was president and was a major force in its establishment), and many housed in his London house and in his private library on 36th Street, near Madison Avenue in New York City. His son, J. P. Morgan, Jr., made the Pierpont Morgan Library a public institution in 1924 as a memorial to his father and kept Belle da Costa Greene, his father's private librarian, as its first director. George Frederick Kunz then continued to build a second, even finer, collection which was exhibited in Paris in 1900. Collections have been donated to the American Museum of Natural History in New York where they were known as the Morgan–Tiffany and the Morgan–Bement collections. In 1911, Kunz named a newly found gem after his biggest customer: morganite. 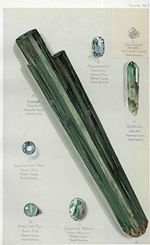 A number of U.S. gemstones from the Morgan collection, considered the best in the world. Morgan was a benefactor of the American Museum of Natural History, the Metropolitan Museum of Art, Groton School, Harvard University (especially its medical school), the Lying-in Hospital of the City of New York and the New York trade schools. Morgan was also a patron to photographer Edward S. Curtis, offering Curtis $75,000 in 1906, for a series on the Native Americans. Curtis eventually published a 20-volume work entitled The North American Indian. Curtis went on to produce a motion picture, In the Land of the Head Hunters (1914), which was later restored in 1974 and re-released as In the Land of the War Canoes. His son, J. P. Morgan, Jr. took over the business at his father's death, but was never as influential. As required by the 1933 Glass-Steagall Act, the "House of Morgan" became three entities: J. P. Morgan and Co. and its bank Morgan Guaranty Trust; Morgan Stanley, an investment house; and Morgan Grenfell in London, an overseas securities house. Through these three entities, J. P. Morgan’s name lives on in the financial business world even today. ↑ Community Partnership. JP Morgan Chase. Retrieved April 16, 2007. ↑ Heather Timmons, “J.P. Morgan: Pierpont would not approve,” BusinessWeek, November 18, 2002. ↑ Morganization: How Bankrupt Railroads were Reorganized. Retrieved April 2, 2007. ↑ Ron Chernow, The House of Morgan: An American Banking Dynasty and the Rise of Modern Finance (New York: Atlantic Monthly Press, 2001), ch. 4. ISBN 0-8021-3829-2. ↑ Peter Krass, “He Did It!” Conference Board Review (May 2001). Retrieved May 10, 2007. ↑ Krass, “He Did It!”; J. P. Morgan, Microsoft Encarta Online Encyclopedia, 2006. Retrieved April 2, 2007. ↑ Vincent P. Carosso, Investment Banking in America: A History (Harvard University Press, 1970), ch. 6. ↑ Carosso, Investment Banking, 42. ↑ Herbert L. Satterlee, J. Pierpont Morgan (New York: Macmillan Company, 1939). ↑ John Pierpont “J.P.” Morgan. Find A Grave.com. Retrieved April 2, 2007. ↑ John Pierpont Morgan and the American Corporation. Biography of America. Retrieved May 10, 2007. ↑ “The Stock Exchange,” Modern Marvels season 3, episode 18, first broadcast October 12, 1997, on the History Channel. Written and produced by Terry Fitzpatrick. ↑ John Pierpont Morgan. Cedar Hill Cemetery. Retrieved April 2, 2007. ↑ George Frederick Kunz, History of the Gems Found in North Carolina, Introduction. North Carolina Geological and Economic Survey, Bulletin no. 12, p. xvi. Available at Farlang Gem & Diamond Foundation. Retrieved April 2, 2007. ↑ Edward S. Curtis, The North American Indian. Northwestern University Digital Library Collections. Retrieved April 2, 2007. ↑ Morganite. International Colored Gemstone Association. Retrieved April 9, 2007. Atwood, Albert W., and Erling A. Erickson. "Morgan, John Pierpont (April 17, 1837 – March 31, 1913)." Dictionary of American Biography, vol. 7. 1934. Carosso, Vincent P. Investment Banking in America: A History. Harvard University Press, 1970. Geisst, Charles R. Wall Street: A History from Its Beginnings to the Fall of Enron. New York: Oxford University Press. 2004. ISBN 978-0195170610 Online edition Retrieved March 11, 2018. Moody, John. The Masters of Capital: A Chronicle of Wall Street. New Haven, CT: Yale University Press, 1921. Online edition Retrieved March 11, 2018. History of "J. P. Morgan"
This page was last modified on 12 March 2018, at 00:06.